Prudhoe Hall Colony Opened August 1914. The Northern Counties Joint Poor-Law Committee Chairman Rev. Samuel Pearson Vice-Chairman Mr. John Davidson. Combined Unions Alnwick, Auckland, Belford, Berwick-upon-Tweed, Carlisle, Castle Ward, Chester-le-Street, Darlington, Durham, Easington, Haltwhistle, Hartlepool, Hexham, Houghton-le-Spring, Lanchester, Middlesbrough, Morpeth, Newcastle-upon-Tyne, Sedgefield, South Shields, Stockton, Sunderland, Teesdale, Tynemouth. Co-opted members, Middlesbrough, Bishop Auckland, Sunderland, North Shields. Matron N.M. Hawkes. Clerk to the Committee J.W. Coulson. MENTE VEL CORPERE INFIRMIS MEDERI. 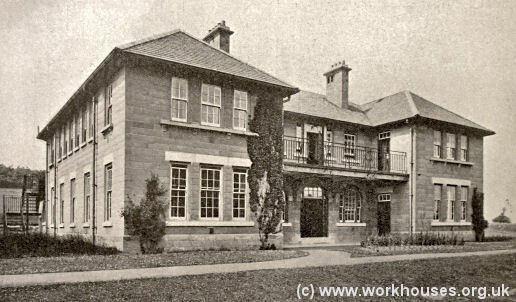 Shortly after the First World War, a number of additional 'villas' were erected with more than four hundred patients in residence. Prudhoe Hall Colony site, c.1938. 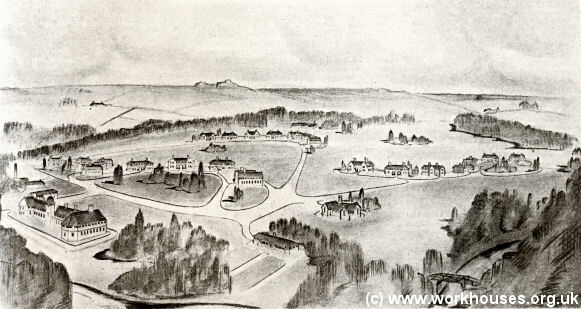 Prudhoe Hall Colony planned layout, 1930. Prudhoe Hall Colony bird's-eye view, 1930. Prudhoe Hall Colony — patients' house, 1930. Prudhoe Hall Colony — patients' house layout, 1930. In 1924, the Northumberland County Council petitioned the NCJPLC to take patients needing residential care from the whole county. However, the proposal was rejected when the Council refused to contribute any funds for the construction of additional buildings at the Colony. The Council then set up their own establishment at Cresswell Hall. In 1930, the colony was purchased by the County Boroughs of South Shields, Sunderland, Darlington, West Hartlepool, Middlesbrough and Tynemouth. Plans were made to increase the accommodation for up to 700 inmates, with the construction of separate areas as 'villages' for men, women and children. However, many of the projected new buildings were never constructed, at least in the form originally envisaged. Prudhoe Hall Colony — infirmary, 1930. Prudhoe Hall Colony — infirmary plan, 1930. During the 1930s, the main Hall building was used as the colony's administrative centre, with its large kitchen gardens and greenhouses providing employment for the patients. Other central facilities located nearby were kitchens, a bakery, workshops, stores, laundry, boiler house, power-generating plant and hospital. A recreation hall provided a venue for dances, film shows and theatrical performances. In 1948, the site became part of the new National Health Service as Prudhoe Hospital. Considerable expansion of the buildings took place in the 1950s and 1960s taking its capacity to 1,500 beds, making it the fifth largest establishment of its type in the country. There were 38 hospital villas with four hundred children based in the Children's Village. The adults were provided with training and employment in an industrial and occupational therapy department. At the time of writing many of the buildings are empty and becoming derelict although there are plans to redevelop the site. The Hall itself and kitchen gardens both have listed building status. English Heritage report on the site.